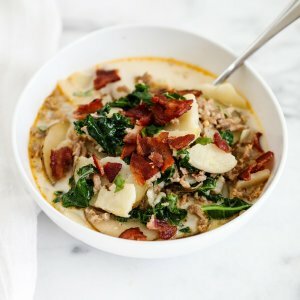 Olive Garden Zuppa Toscana - Loaded with potatoes, sausage, kale and bacon to make the most comforting and delicious soup. Full of flavor and has the perfect amount of spice. Plus, it's made in just one pot in less than an hour! Cook the Italian sausage in a dutch oven over medium heat, until browned. After a few minutes, add in the chopped onions and cook for 1-2 more minutes. Drain any extra grease, then remove sausage mixture from pan and set aside in a bowl. Add the bacon to the pot and cook until crisp. Remove bacon and place on a paper towel lined plate. Leave about 1 Tablespoon of bacon grease in the pan. Add the sliced potatoes and cook for about 5 minutes. Pour in the chicken broth and water. Bring to a boil and cook until fork tender, about 10-15 minutes. Turn heat to medium-low and slowly add in the half and half and cooked sausage. You can temper the cream by adding a Tablespoon of the broth to the cream before adding to the top. Simmer for a few minutes. Add the kale just before serving. Salt and pepper, to taste. Ladle soup into a bowl and top with crumbled bacon.